Mix together gram flour, rice flour, asafoetida, chilli powder, carom seeds, salt, cumin powder, coriander powder, baking soda, chaat masala, turmeric powder and coriander leaves in a bowl. Add sufficient water and whisk to make a thick and smooth batter. 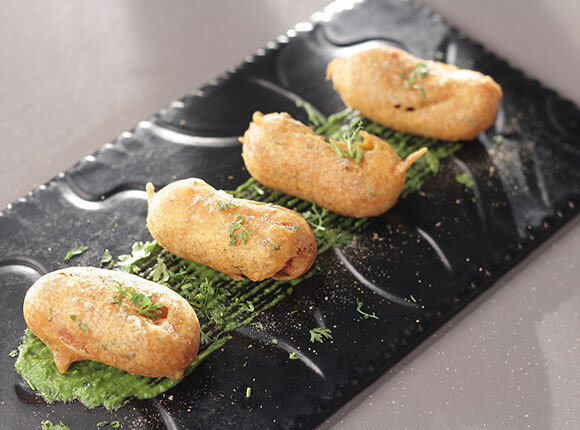 Dip cocktail sausages in gram flour batter and deep-fry in hot oil till golden brown. Drain on absorbent paper. Sprinkle chaat masala and coriander leaves and serve hot with green chutney.